Dog appeasing pheromone, more commonly known as DAP, is a product that aids in calming nervous or anxious dogs. It has many uses, including reducing anxiety related to various phobias and easing the introduction of a dog or puppy into a new household. DAP can be used as aid in ending unwanted barking, whimpering and whining, chewing, urination and defecation when those behaviors are a result of anxiety, stress or fear. It can be used to treat dogs with separation anxiety, which often results in excessive barking, unwanted destruction, inappropriate urination or defecation and other unpleasant and unhealthy behaviors when a dog is left alone. Dog appeasing pheromone (DAP) mimics a natural pheromone that is produced by a mother dog to calm and reassure her puppies. A pheromone is a substance that is secreted by an animal and released into the animal’s environment to have an effect on other animals in the same species. Though mother dogs secrete the pheromone to calm their puppies, adult dogs respond to it as well. I have found DAP to be useful in dogs with mild to moderate phobias or separation anxiety. It is less effective for dogs that have severe phobias. In addition, I believe that in many instances, for dogs that require tranquilizers or mood altering drugs (such as Xanax, Clomicalm, Reconcile, Prozac, etc.) to help calm their fears, DAP can be effective in lowering the dosage of the chemical needed to gain the desired effect and make the dog less frightened. DAP comes in several different forms and each has its own advantages. The diffuser is nice because it can be plugged into an electrical outlet in the home and it will provide a continual effect for a period of approximately one month. 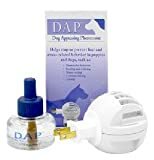 I have had some of my veterinary clients that used the DAP diffuser for their dogs tell me that they can tell, based on the dog’s behavior, that the time to change the diffuser has arrived. To me, that is clear proof that the product is working. However, the diffuser will only work for dog while the dog is in the house. DAP collars are also available. The collars are embedded with the pheromone. The advantage to a collar is that the collar can travel with the dog wherever the dog goes. This is useful for taking your dog on a walk, to the groomer or even to the veterinarian. In my experience, the collars are just as effective as the diffuser. DAP is also available as a spray, which can be useful for smaller dogs that are transported in a carrier or for dogs that are fearful of the car. In these cases, DAP can sprayed directly into the carrier or the car to help ease your dog’s fear of these objects and the stress he may feel being confined in them. Who Can Benefit from Using DAP – Dog Appeasing Pheromone? Any dog that has mild to moderate fears or phobias can benefit from the use of DAP. Dog Appeasing Pheromone is also helpful for dogs that suffer from mild to moderate separation anxiety. When introducing a new puppy or dog into a household, DAP can help ease the transition. It can also help reduce tension between dogs in a household. Reduces or prevents stress related behaviorCalms dogs during thunderstorms, fireworks, visits by strangers, or moving to a new homeHelps puppies adapt to new environmentsCoverage Area: 500-700 sq. ft. 50-70m One vial lasts approximately four weeksFemale dogs secrete pheromones that comfort and reassure their nursing puppies. These “appeasement” pheromones have the same calming effect on adult dogs. DAP. mimics these appeasement pheromones to reduce or eliminate stress in dogs of all ages. 3 PACK of DAP Dog Appeasing Pheromone Electric DiffuserReduces or prevents stress related behaviorCalms dogs during thunderstorms, fireworks, visits by strangers, or moving to a new homeHelps puppies adapt to new environmentsCoverage Area: 500-700 sq. ft. 50-70m One vial lasts approximately four weeksFemale dogs secrete pheromones that comfort and reassure their nursing puppies. These “appeasement” pheromones have the same calming effect on adult dogs. DAP. mimics these appeasement pheromones to reduce or eliminate stress in dogs of all ages. 6 PACK of DAP Dog Appeasing Pheromone Electric DiffuserReduces or prevents stress related behaviorCalms dogs during thunderstorms, fireworks, visits by strangers, or moving to a new homeHelps puppies adapt to new environmentsCoverage Area: 500-700 sq. ft. 50-70m One vial lasts approximately four weeksFemale dogs secrete pheromones that comfort and reassure their nursing puppies. These “appeasement” pheromones have the same calming effect on adult dogs. DAP. mimics these appeasement pheromones to reduce or eliminate stress in dogs of all ages. Find more DAP Dog Appeasing Pheromone Electric Diffuser products on Amazon!